Samsung LE37B650 review | What Hi-Fi? 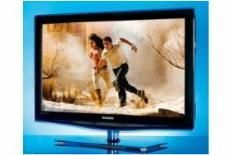 If you want a TV that looks to the future and offers most of it today, the Samsung LE37B650 is it. Styling is top notch too, with Samsung's trademark Crystal TV design and Platinum Black finish taking centre stage. There are four HDMI inputs to fill, 100Hz picture processing to investigate, and DLNA compatibility for streaming content to the TV from compatible products. All this is even before we touch on Samsung's Medi@ 2.0 content service. Similar to Panasonic's Viera Cast, Medi@ 2.0 gives you access to multimedia widgets from Yahoo, YouTube and other online sources. Blu-ray images are in keeping with this TV's luxurious look. Black levels are arguably the best around. Part of the TVs success in this area is down to the uniformity of – and lack of intrusion from – the TV's backlight which is a key point to consider. In Valkyrie, as Tom Cruise makes his way to the Wolf's Lair, the glossy black paint job of his chauffeur-driven car looks fantastic, and the sense of three-dimensionality is almost startling. Detail levels with both Blu-ray and DVD are consistently strong and amongst the best in its class. Skipping to standard definition material doesn't leave any feeling that you're being shortchanged. The Curious Case Of Benjamin Button still maintains a cohesive appearance married to sharp edge definition. Colours do err on the rich side, but stop short of appearing overcooked. Movement is handled well, which should be expected, given that the TV gives you the option of trying out umpteen different motion-processing modes. Freeview performance is a slightly different story. On-screen noise is more prevalent and these digital artifacts spoil the overall clarity and stability of image. The picture is still good by LCD standards, but there are other TVs that handle off-air performance with greater confidence. However, the biggest letdown of the Samsung has to be its sound quality, which is thin and insubstantial, even by flatscreen TV standards. These misgivings take the gloss – and a star – off what's otherwise a slick, future-proof TV, but this Samsung remains a key contender if you use a separate sound system.